In the Wild | Civilian Conservation Corps | A Continuous Lean. One of FDR’s first programs enacted under the New Deal was the establishment of the Civilian Conservation Corps or CCC as it came to be known. The program enlisted thousands of out-of-work young men throughout the United States to “focus on natural resource conservation” at National, State and local park-lands. 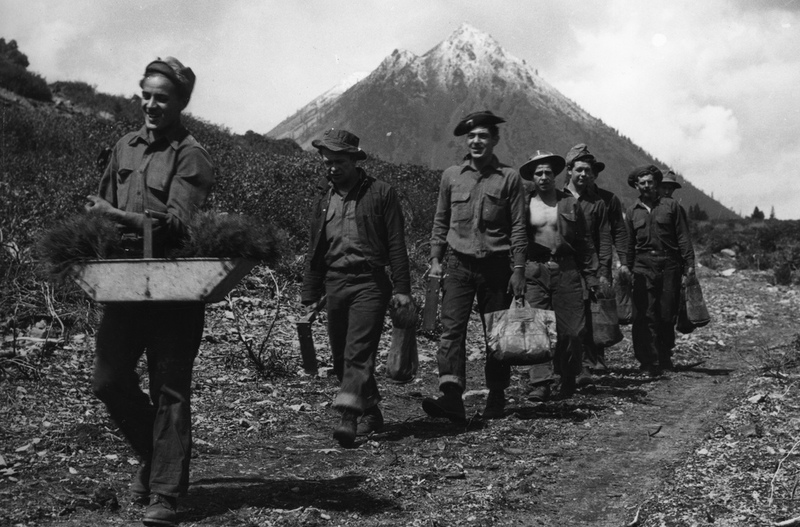 Oregon State University has a beautiful archive of images from the days of the CCC. Some of my favorites below. I just want to add: you know that picture with the “M” sweater is being printed out at RL right now! Wow, these are great. I’ve been reading some literature and biographies from the 20’s-50’s for inspiration, but I’ve kinda skipped the depression. I guess it’s time for me to go back. I see knee high logger boots on the runway for next fall. look out! These photos are Black & White bliss! I can see that sweater with an “A” on it. I see a few non-Anglo faces in the crowd and as a person of colour I have always wondered what the social dynamics were like during those hard times for all. Thanks again Michael for a great find. I’m a wee bit of a newbie to your site but feel compelled to tell you how wonderful it is and how I appreciate your posts! Forget the M sweater. Give me the half button with the double flap pocket. I wonder if this would work today? There are some places in the world (some here in the US) that could benefit from the help of able bodied unarmed wokers! Awesome photos! I expected to see a lot of bush shirts and plaid shirts. Would the typical “out-of-work young men” in the US submit to this sort of project today? I’m not so sure. Perhaps only under the supervision of armed wardens, maybe. I saw lot of work the CCC boys did in upper Wisconsin. Very cool pix. how do you find these things?? amazing post. I wish more contemporary designers would pay attention to how the clothing in these pictures *fits*. It may sometimes appear to be too large, but it *never* appears to be too small. It’s work clothing, for working in. The current one-size-under look will be something people photographed in it will sharply regret, a decade from now. I go to OSU and never knew my university had a flickr account. How do you find such great finds. My grandmother was in the girl’s version. For younger people it was apparently really fun. The CCC is still going strong today. I participated in the CCC Backcountry Trails Program in the summer of ’07. The CCC backcountry trail crews continue to keep the legacy alive by maintaining California’s National Forests.